Whether you’re looking for a new curb to improve an outdoor area and reduce maintenance time and costs, or need Curb Restoration of an existing curb that’s seen better days, we can offer Concrete Landscape Border work of the highest quality and beauty that will transform your property while making your life easier. 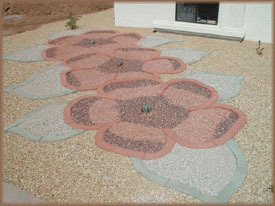 We offer a huge variety of Concrete Curbing Services with plenty of options for colors, designs (including curves, turns, and contours), finishes and textures, in smaller or Large Curbs, which means we can match any vision your have for your front lawn, backyard entertaining space, or any other outdoor space at your home. Best of all, Concrete Curbing is the best possible root barrier you can have, helping to control and maintain growth so your hard work in landscaping doesn’t get undone by Mother Nature in a few short years. That means your design vision stays looking new, crisp, and beautiful for longer. • come in a large array of sizes and configurations, including 6 x 6 x 8, 4 x 6 x 6, or Large Curbs like 8 x 8, 6 x 8, 6 x 6, and 4 x 8.